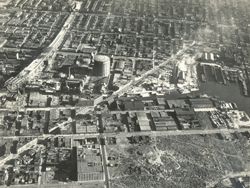 Gas used for cooking, lighting, heating and commercial purposes was manufactured and distributed at the Metropolitan Manufactured Gas Plant. 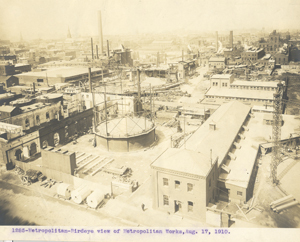 A predecessor to the Brooklyn Union Gas Company began operating the Metropolitan site as an MGP in 1871. By 1904 the Brooklyn Union Gas company was operating the site. The medium-sized facility produced gas until the 1930’s, at which time it was decommissioned and the site became used for storage. By the late 1940’s portions of the site had been subdivided and various parcels sold, and the remainder of the site was sold in the 1950’s. 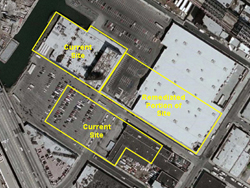 The 7.8 acre site has multiple parcels and owners, with the largest parcel having been developed as a Pathmark supermarket. The eastern portion of the site was investigated under a Voluntary Clean-Up agreement by its then owner, the U.S. Postal Service, and subsequently developed into a Lowe’s store. All of the site is developed, either with buildings or paved parking lots. National Grid has no liability with regard to the eastern portion of the site, but does for its western and southern portions. 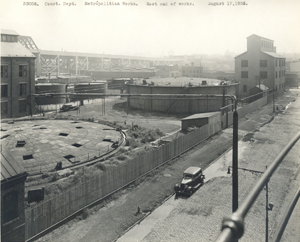 National Grid is responsible for the investigation and remediation of these portions of the site because it was operated by a predecessor company (Brooklyn Union) during the time MGP-related contamination occurred. This website provides information on the Metropolitan former MGP Site, the Remedial Investigation of the site, and opportunities for public participation. National Grid is committed to the protection and enhancement of the environment, always seeking ways to minimize the environmental impacts of our past, present and future activities. We hope this website, a part of our public participation and outreach efforts, is helpful and informative. If you need additional information or have suggestions to make our website better, please contact the individuals listed under Contacts. National Grid completed the Supplemental Remedial Investigation field work in 2017 under the direction of NYSDEC. The NYSDEC has requested that National Grid conduct additional sampling, and National Grid is planning to complete this additional sampling prior to completing the Supplemental RI phase of the work. National Grid is committed to keeping the community informed of our activities during this work. We will continue to post updates online. Any questions can be posed by calling National Grid’s Hotline for the former Metropolitan MGP Site at (718) 982-7349. All previous site updates will be located in the Key Documents tab under the Report Archive section. Remedial Investigation field work commenced in late-March at the former Metropolitan Works MGP as part of the New York State Department of Environmental Conservation (NYSDEC)-approved Remedial Investigation Work Plan (RIWP). The work includes the installation of soil borings, monitoring wells, test pit excavations, and indoor air and sub-slab soil vapor points to gather information required to determine the nature and extent of impacts at the former Metropolitan Works MGP. Remedial investigation field work including soil boring pre-clearing, soil boring advancement, and monitoring well installation in right-of-way areas along 2nd Avenue and 12th Street. Continue with remedial investigation field activities, including soil boring pre-clearing, soil boring advancement, and groundwater monitoring well installation at a private property.